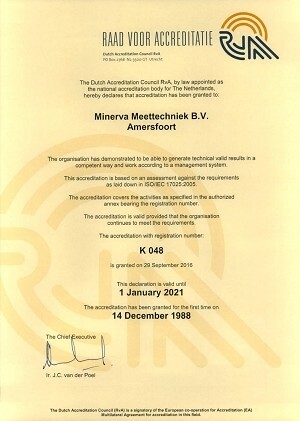 Minerva has an outstanding, highly-accurate and innovative calibration laboratory in Amersfoort, the Netherlands. Accreditation has been issued since 1988 by the Dutch Accreditation Council (RvA) and assures worldwide recognition by the ILAC Mutual Recognition Arrangement (ILAC MRA). Our accreditation is based on the ISO/IEC 17025 standard. With this worldwide accreditation Minerva can calibrate a very wide range of specialist pressure calibration equipment, ranging from 0 Pascal absolute (vacuum) till 5000 bar. For more information, visit the RvA website or download Minerva’s Technical Scope 2017 of our calibration lab. In this scope, you can find which types of measuring instruments we can calibrate including our demonstrated measurement uncertainties. We are proud to present our calibration facility that has been fully renewed in 2016. Contact us or request a quote for our calibration and repair services.